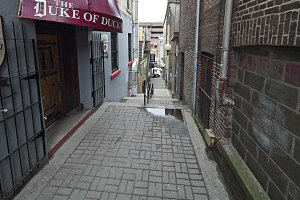 Although I did not know it at the time, we passed through quite a noteable spot on our way down to the main artery of Water Street: McMurdo Lane, a narrow city back-alley, is where the popular CBC TV crime drama show Republic of Doyle's Jake Doyle has his P.I. 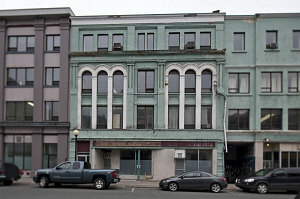 office, above the Duke of Duckworth Pub. 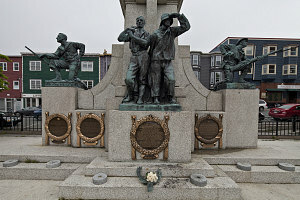 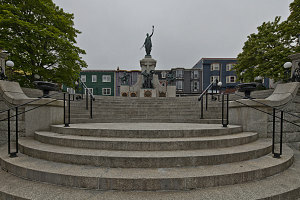 We wandered back and forth along Water Street, stopping at a few shops and visiting the "National" war memorial (built at a time before Newfoundland's entry into Confederation in 1949). 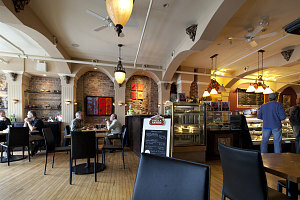 Then, based on a very good recommendation from the owners of the gift shop Home, we went to have a quick lunch at a great spot called Bistro Sofia (also on Water Street). 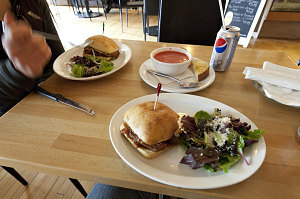 Its a trendy, hippish sort of spot, but forget all of that - the food was excellent. 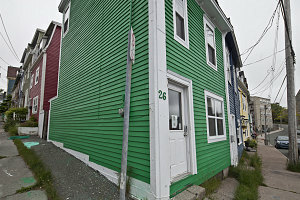 Many thanks to the guys at 'Home'! 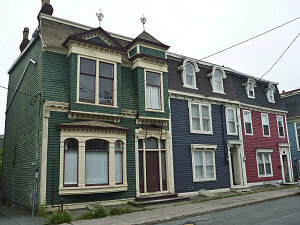 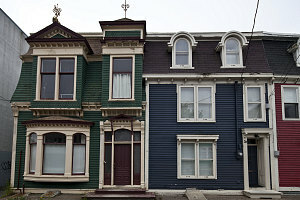 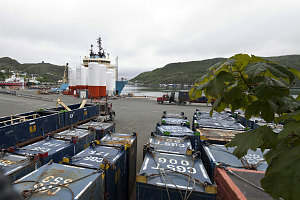 Ok, so we had packed quite a lot into our whirlwind morning exploration of St. John's. 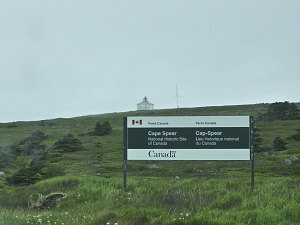 It was almost time to think about heading to the ferry, but we had one more spot we wanted to visit: nearby Cape Spear, notable as the easternmost point in North America. 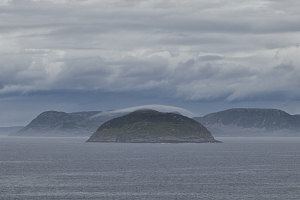 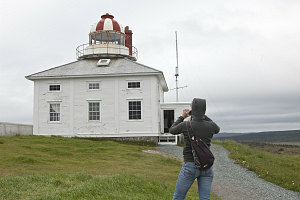 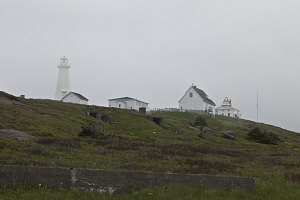 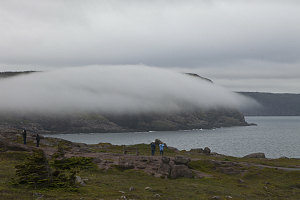 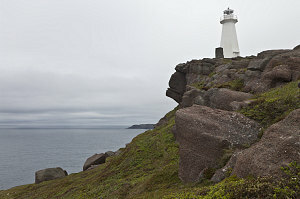 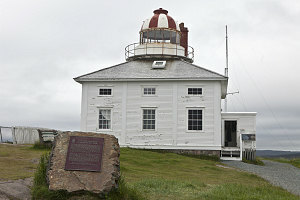 It was a short fifteen minute drive from downtown St. John's to the open barrens at Cape Spear National Historic Site. 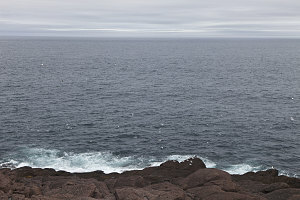 We walked over to the easternmost point of land we could find, at about 52.6167 degrees west (any farther and we would have been in the waters of the Atlantic). 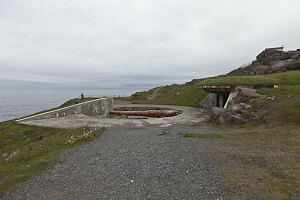 We had a quick look around, at the World War II gun battery and at the old and new lighthouses, then rushed off - we had to be sure we presented ourselves at the ferry at the proper time. 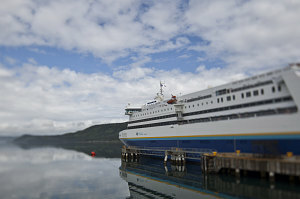 We made good time to the ferry, arriving not quite at 2 hours before but not far off, and as it turns out, there was no rush at all. 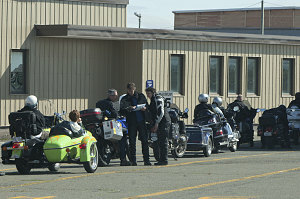 We waited in the holding lot in the sun (yes, it had actually become sunny for a while) for a very long time, and noted that many cars were trickling in after us, well after this 2 hour limit (which, at least under normal circumstances, is super conservative). 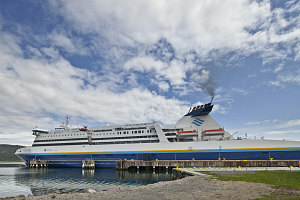 We spent our time wandering around, taking pictures of the very large ship -- the MV Atlantic Vision -- that was to take us from Newfoundland to Nova Scotia, and in general just not doing too much. 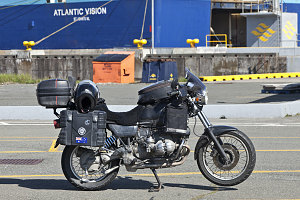 To our mutual surprise, we again ran into round-the-world motorcyclists Brian and Jenny. 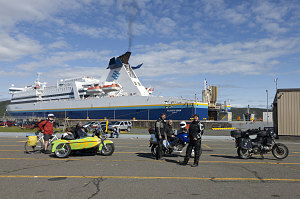 Apparently we have an affinity for choosing the same ferry crossings. 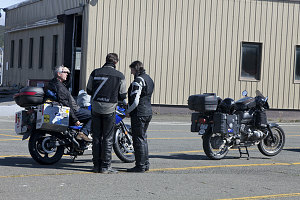 We decided to meet up for dinner later on the ferry. 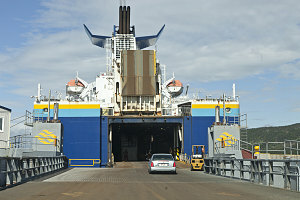 Finally on board the ferry and securely parked in the cavernous hold, we made our way up. 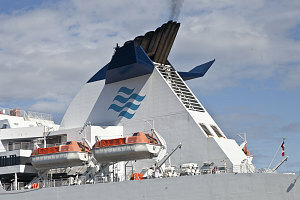 The ship has ten decks, and is a quite modern ship that was built in the year 2000. 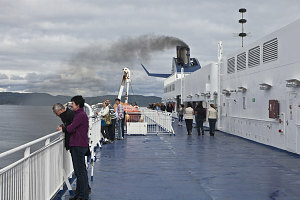 The interior is not at all like the slightly-shabby 70s era MV Apollo that we were recently on. 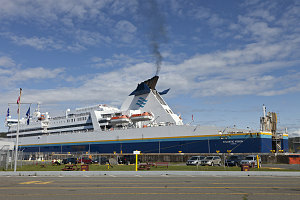 I had booked a private 2-berth room for our journey to Nova Scotia. 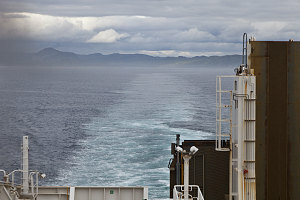 This made the journey a bit less like a low-budget ferry crossing and more like a mini-cruise. 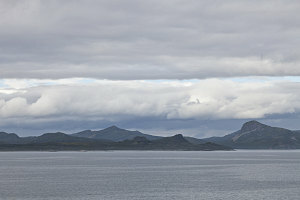 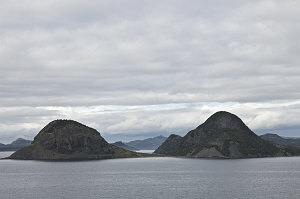 After all, we had a long 13-hour crossing ahead of us, and it was nice to have a full bed, a shower, and some privacy. 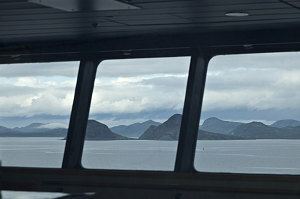 After obtaining and checking out our room, we headed onto the the deck to watch the scenery go by. 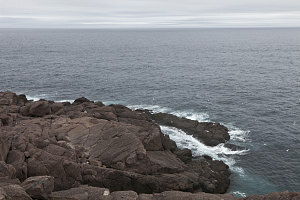 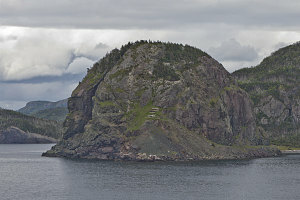 This would be our last view of Newfoundland - a place which I knew would be interesting but which had surpassed my expectations. 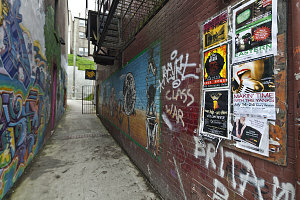 Too bad that all these years I had not given this bit of my 'backyard' more serious consideration!.